I came across Banyan Bar when I was trying to find somewhere near the Manchester Arena for food, as I was going to see something there. I knew that the Corn Exchange had been refurbished and lots of restaurants have moved in. Owing to the warm weather in Manchester at the time, I decided that somewhere that served salads would be a good option, and settled on Banyan. With my partner in tow, we headed inside. I actually quite like the inside of Banyan Bar. 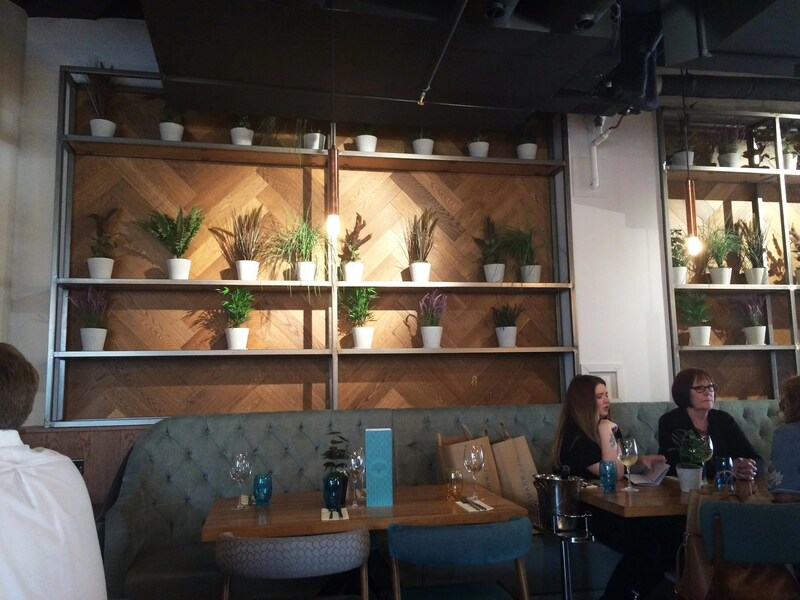 The mixture of wood and metallic elements alongside soft furnishings and plants gives it a very warm feeling. 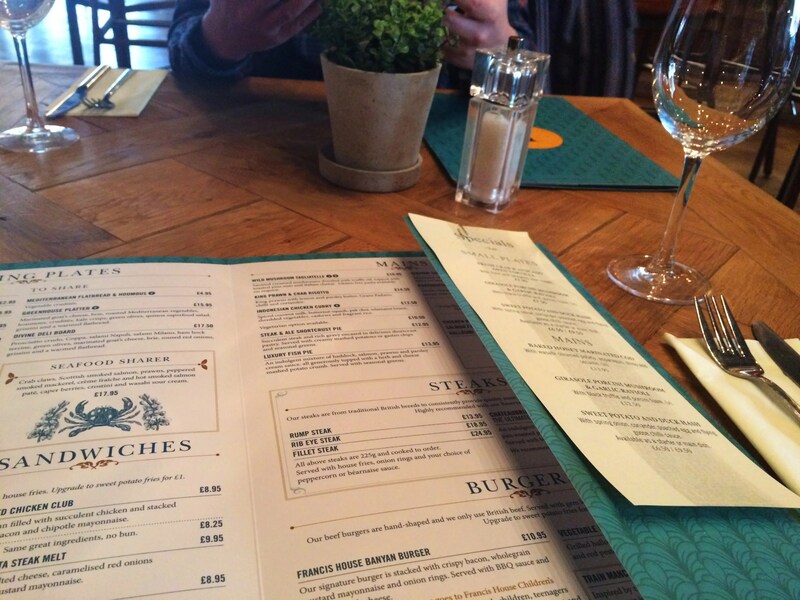 I really like the greeny blue colour going through the interior from the colour of the bar to the menus. The windows are really large so they let in a fair amount of sunlight. There is also ample seating outside if you manage to catch Manchester on a sunny day. I originally wanted to order a Mango Tango but was informed that they ran out of mangoes, how disappointing. I haphazardly ordered a Revitalise, which contains kiwi, blueberry, raspberry, passion fruit, apple and lime. This was nice enough but not as nice as the Banyan Blushing Mexican, which contained guava, almond, blueberry, cucumber and lime topped with ginger. The latter was sweeter and appealed to me more. Jon: I really liked both drinks. 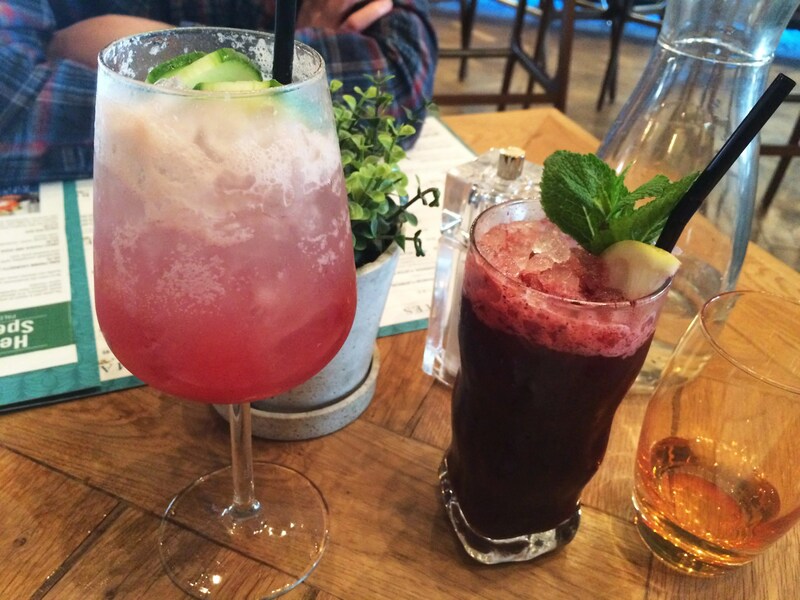 The Revitalise was sour yet fruity, healthy and fulfilling. The Blushing Mexican was much sweeter, but that isn’t a bad thing for a mocktail. The salad contains chicken breast, shredded vegetables, cashews and peanuts, drizzled with a lime chilli dressing. I always tend to like Asian style salads as they mix sweetness with sourness and saltiness perfectly with sometimes a hint of heat; this salad fits all those categories. It’s a shame there isn’t a lot of it on the plate. Salads aren’t known for their bulk, so more vegetables would have been nice. 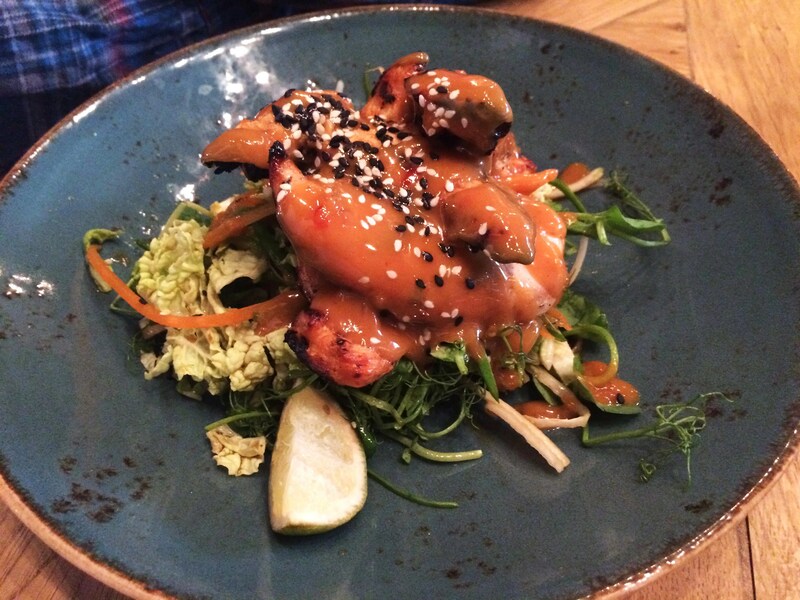 Artisan does a better version of the bang bang chicken, and it’s advertised as a small plate. Jon: On paper this salad seemed to do everything right, but nothing really came together. The salad dressing was too sour, the chicken sauce was too salty, and the two didn’t combine very well at all. The portion of chicken was adequate but nowhere near enough vegetables made this a very unsatisfying meal. 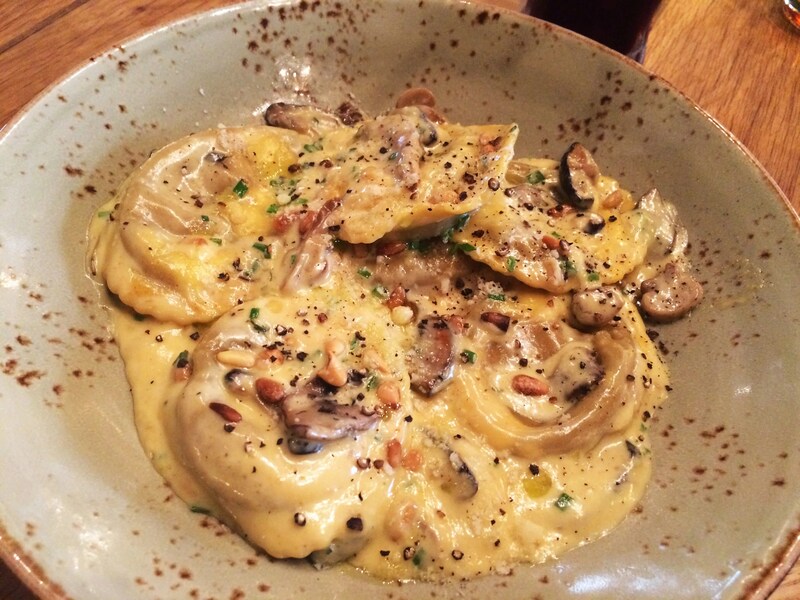 I ordered the ravioli as it combined two of my favourite things, mushrooms and garlic! This plate looked small initially, but it’s actually quite filling. Their ravioli were generously filled and they were not shy with the garlic either. I did find this dish too salty, though. Jon: They were slightly salty, but I only had one of them so I can’t really comment on it. The rest of the taste was spot-on, with just the right amount of mushroom and garlic. 5/10 -2 for small salad portion, -1 for the saltiness of the ravioli dish, -2 for the service; it took us ages to get our drinks and even longer to grab someone to place our food orders. Once you did grab the attention of someone, the service was quite decent. Jon: 4/10 -2 for salad portion, -2 for salad dressing, -2 for service. I would probably not visit Banyan Bar again. This place is an upmarket pub, so maybe if you want drinks with ok-ish food, but I feel like you could get better elsewhere for the price. Jon: Not to eat, you’re paying restaurant prices for pub quality food. The drinks were good though and if I found myself staying for those I wouldn’t be against ordering something simple. 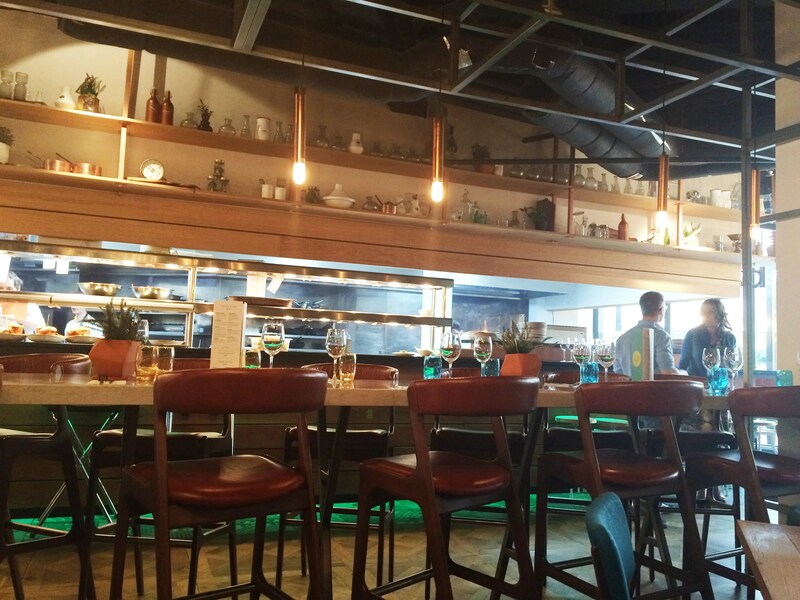 Have you visit Banyan Bar before? What do you think of the food we ordered?